Earlier this month, the Ecuadorian Government announced its plans to introduce a digital currency, the first of its kind globally. In a country where 40% of citizens don’t have a bank account according to The Economist, this has the potential to transform banking and allow companies to gain access to those without a bank account for the first time. New innovations in financial technology are having a huge impact on emerging markets worldwide, from mobile banking schemes in east Africa to the Dominican Government’s plans to send all SMS-capable residents a small, unspecified amount of bitcoins. These schemes are benchmarks for other emerging markets looking to progress through financial innovation, and Ecuador’s decision in particular may have far-reaching implications for crypto currencies worldwide. Ecuador’s initiative was inspired by Bitcoin, the stateless online payment scheme which aims to provide a standard method of online payments. The country’s decision to go digital takes inspiration from financial innovations in the Western world, where banks and companies are looking to exploit existing technologies to deliver innovative solutions – Apple’s ‘mobile wallet’ and French bank Banque Populaire Caisse d'Epargne’s plans to introduce a Twitter-based payment scheme are great examples. Bitcoin’s potential for emerging markets is vast. It removes the need for banks to act as ‘middlemen’ between companies and individuals, slashing the cost of transactions. Its flexibility and availability to anyone with an internet connection makes it well suited to emerging markets, where individuals may have limited access to banks, but good access to mobile phones and often an internet connection. Although its crypto currency status raises questions around its use, commentators in Forbes have argued that it will raise the global standard of living if regulated lightly. As the first nation to endorse a crypto currency, Ecuador is likely to notice several benefits. The digital currency will simplify integration with online trade by side-stepping the need for physical transactions. As such, businesses (particularly those in eCommerce) will be able to adapt to a ‘mobile native’ approach smoothly, while those with international operations will find it easier to transact globally once crypto-currencies are more widespread. Reliance on mobile for internet access is a common theme across emerging markets; entrepreneurs in Zimbabwe are using this pattern to pioneer Africa’s first cashless society, according to the Guardian. While Western economies are still used to more traditional ways of banking, reliance on mobile devices in emerging markets will accelerate the rate of development for a ‘digital-first’ financial environment, by adapting to the pace of change more effectively. The nature of Ecuador’s plan may even encourage an influx of talent to the country, not only helping to shape a new finance system, but to support wider economic growth. Concerns around security and its use in illicit transactions have raised questions around the validity of Bitcoin and other crypto currencies. As such, Ecuador’s decision to introduce its own version is a boost to the concept as a whole, an endorsement that should help to legitimise Bitcoin and similar currencies. 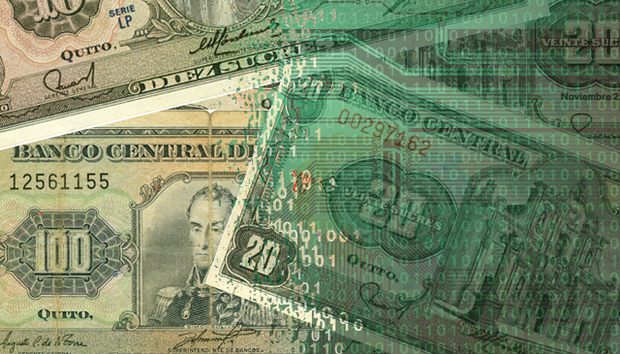 While its adoption in the Western world will be a long and complicated process, we may start to see similar examples of fintech innovation across Latin America. Crypto currencies are often backed by libertarians, who may be intrigued by its freedom from any Government regulation. Libertarians represented 44% of Bitcoin users last year (Business Insider), and may be sceptical of Ecuador’s digital currency as an example of Government encroachment on personal freedom. Despite their role in building the profile of crypto currencies, libertarians may prove to be an obstacle to their growth worldwide. Ecuador’s move can actually push crypto currencies more to the mainstream, diversifying the user base thus giving crypto-currencies legitimacy. Ecuador’s digital currency has the potential to lead the way for similar currencies to be implemented across other emerging markets. Fintech innovations worldwide are allowing companies to transact across the globe with more and more countries than ever before, using the internet and not the traditional financial system, as infrastructure. Ecuador’s initiative might be the first signal of adopting crypto-currencies as means for growth. It may help the country to leap-frog the West to a robust fully digital financial system. The question of the impact of this move on the monetary policy of the country is an entirely different debate.